Every year about 21,80,00,000 citizens face natural disasters. About 250 thousand lose their lives in these disasters with the economy too suffering a stroke of about $936 billion. In India, from the year 2000 to 2017, natural disasters have claimed lives of more than 76,000 civilians. Moreover, these have also caused the economy, a loss of ₹4 trillion. The number of natural disasters such as floods, earthquakes, cyclones, tsunamis is terrifying. Apart from this, man-made disasters such as riots, bomb-blasts, fires, nuclear-chemical-biological warfare too occur all of a sudden. With environmental degradation, climate change and global happenings, the magnitude and threat of such natural and man-made disasters are on the rise. Although we cannot prevent these disasters, it becomes inevitable on our part to be prepared and arm ourselves to protect our lives and curb disaster-related losses. We ought to train ourselves to build up resilience to tackle these calamities. Such specially trained civilians can prove to be of immense help in the rescue operations during such emergencies. 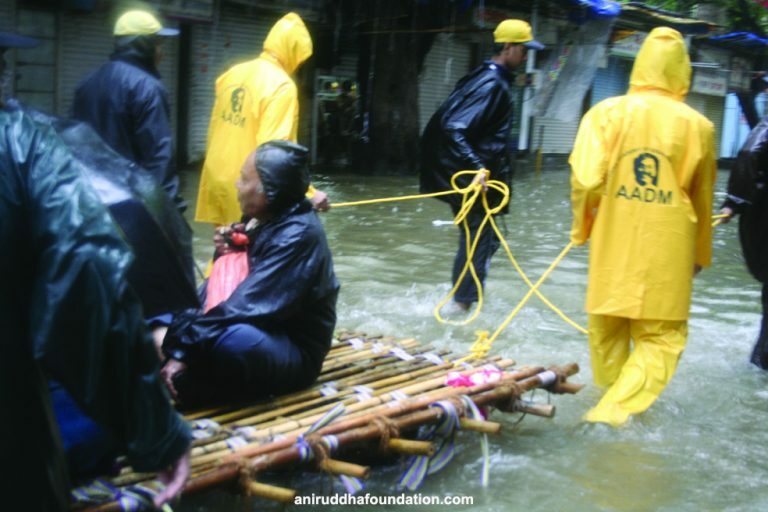 Aniruddha’s Academy of Disaster Management (AADM) trains and equips volunteers and citizens to face such disasters. It was the horrific terror attack on the Parliament on 10th December 2001 that prompted Bapu to establish the Aniruddha’s Academy of Disaster Management, identifying the pressing need for training in disaster management. The Academy is the result of Bapu’s extensive research and untiring efforts. The foremost objective of the AADM is to build a volunteer base that would reach out to the ordinary civilians at the time of such calamities. Irrespective of their religion, gender, caste or creed, the academy strengthen volunteers to cope with and respond to major disasters and to offer real support to the government agencies when required. Furthermore, the training imparted is free of cost. So far, it has trained around 73,191 volunteers. They are known as the Disaster Management Volunteers (DMVs). The academy teaches a person to save other’s life without losing his, during and in the aftermath of the natural or man-made disaster. 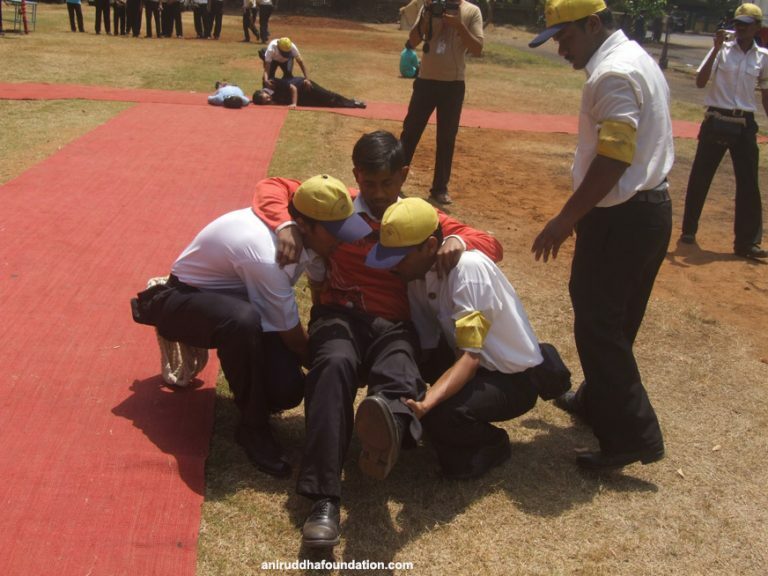 The course also trains in various rescue techniques, fire-fighting equipment and techniques, bandages, knots, stretchers, C.P.R. (Cardio-pulmonary resuscitation, i.e. reviving the heart and the lungs) and so on. Practical and drills based on the same are organized on a regular basis. The volunteers of the pilot batch trained the following batches, from which the trainers were chosen. These trainers now conduct the AADM courses at several places. The AADM DMVs are always on their toes during the crucial time of disaster. The arrangement to connect with all the DMVs is set up at the AADM Head office. Their contact numbers and other essential details have thus, compiled for this purpose. This network becomes active in the event of a disaster when the local authorities ask for help. Messages are sent out through mobiles or other relevant mediums. The DMVs available at the moment rush to the scene and as directed by their coordinators assist the government authorities. When a natural or manmade disaster strikes, it becomes imperative to control the crowd of spectators it attracts and to calm the resultant chaos. Effective crowd management to maintain an orderly flow plays a crucial role during festivals too. Thus, overreacting and panicking in the face of such situations proves pointless; rather focus should be narrowed down to make optimum use of available resources. While rendering relentless service, a person needs to stay calm and work with full commitment. The AADM course trains DMVs to such a degree. The city of Mumbai witnessed the worst disaster on 26 July 2005 due to a massive cloudburst. A record-breaking rainfall was recorded within an hour. Even the places, which had not been categorised as flood-prone areas, were under water. Floodwaters inundated the Mithi river. The sudden release of water from the overflowing dams invaded nearby homes till one to two floors of the buildings. The service offered by the AADM volunteers, in such tough times was truly matchless. At the time, the DMVs used rafts, made out of waste airtight plastic bottles and ferried women, children and elderly citizens to safety. At some places, they also helped the local vendors in shifting their goods to a safer place. Moreover, at many places, AADM also distributed clothes and medicines to the ones affected by the calamity. Following the incident, the Brihan Mumbai Municipal Chief invites AADM to design the monsoon disaster planner, every year. The AADM volunteers always render help during times like these in the monsoon. When landslides occurred in Saki Naka and Kurla, the DMVs assisted the police and fire-brigade in extricating bodies from the rubble, moving the casualties to the hospital, doing the first-aid and moving the debris and heavy rocks from the location. The DMVs also actively assisted the police and the fire-brigade authorities when the fire broke out at the office of Fairdeal Corporation (Jogeshwari- 26 January 2006) and Hansa Industrial Estate (Sakinaka, Mumbai) due to short-circuit. DMVs lifted the casualties to the hospital, during the Zaveri Bazaar-Mumbadevi bomb-blasts. On 11 July 2006, when the Western Railway local train bomb blasts occurred, the DMVs helped in shifting the casualties to the hospital and assisted the staff in the first aid and registration at the hospital. The DMVs also actively participated in helping the authorities post the bomb blasts in Ghatkopar and Mumbai Central on 2nd and 6th December in 2002. Crowd Control during several public celebrations: Ganapati immersion and reimmersion – Every year, the Ganapati festival is joyously celebrated in Mumbai, Thane and Pune. The Chowpatty (beaches) and other locations are densely crowded with devotees gathering there for the visarjan on the One and a half, second, fifth, seventh and tenth day of the Ganapati Utsav. The contribution of the AADM volunteers for crowd management during times like these is hence, considered of utmost importance. They also help government bodies, such as the Municipal Corporation, Police, Fire Brigade for the same purpose. 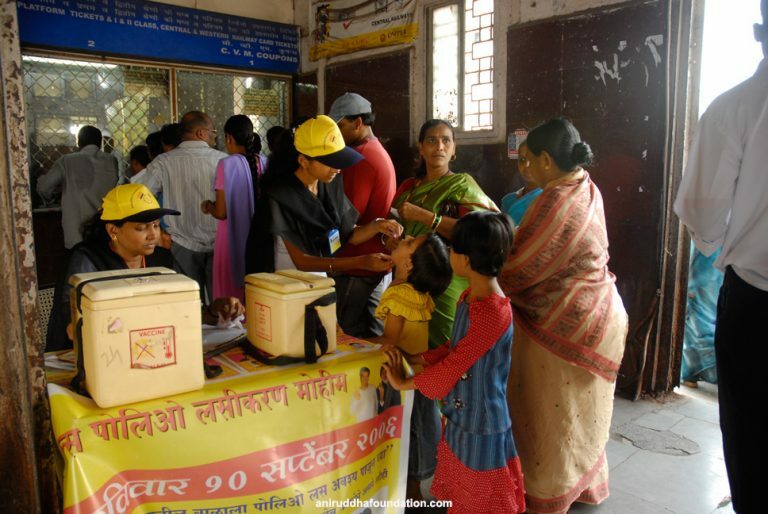 This AADM Seva is carried out in 51 places across Maharashtra, including Mumbai, Pune and Thane. More than 6000 DMVs participate in this Seva. The local authorities in Mumbai and Pune have often acknowledged and appreciated the contribution of the DMVs. The DMVs are present at the prime location of the Visarjan until the last of the idol gets immersed at dawn. Apart from this, the idols that float out on the next day, after the Visarjan are also re-immersed by the AADM volunteers. Every year, the DMVs participate in this re-immersion seva in large numbers which is conducted on the next day of the Anant Chaturdashi, at the behest of AADM’s sister organisation, Shree Aniruddha Upasana Foundation. The DMVs re-immerse the undissolved parts of the Ganesh idols deep in the sea waters. The government has frequently appreciated this valuable contribution of AADM. 2. The AADM volunteers also manage the crowd at the Jyotiba’s (temple) annual event, Kumbh Mela, Mount Mary fair (Bandra) and on the occasion of Dasnavami at Sajjangad. 3. The DMVs also assist the police during Chaitra and Ashwin Navratri for crowd management, at Siddhivinayak Prabhadevi, Mumbai, Ganpatipule (Ratnagiri), Siddhatek (Daund, Pune), and Saptashrungi (Vaani, Nashik). Moreover, they have also assisted the police force and local authorities in line-control, water distribution, and have provided medical assistance. The DMVs also help in controlling the crowd in the fairs conducted in Mumbai and other places (Babulnath, Mahabaleshwar Temple, Ambarnath Temple and 11 other places) on ShravaniSomwar (Shravan month’s Mondays) and Mahashivratri. 4. In 2005, at Mandhradevi Annual Fair, a stampede had occurred which led to the unfortunate death of 250 devotees. After this incident, our DMVs had helped to regulate crowds at this place. The then Prime Minister had also appreciated the assistance provided by the male and female DMVs. After the unfortunate incident, our DMVs had been controlling crowd management for quite a few years. 5. During the summer of 2017, people had thronged in large numbers to the Jijamata Udyan to watch the Penguins. The authorities were able to tackle the crowd with the help of DMVs. 6. The DMVs had also helped the authorities in managing the crowds queuing up for filing Income Tax returns. 7. The crowd management Seva is done every year on the occasion of Nathshashti at Paithan, Aurangabad. Thereafter, the AADM always assist the government and local authorities, on their demand. The polio vaccination is given to children under six years of age through the campaign arranged under the government. On the request made by the Municipal Corporation, the AADM makes the volunteers available for assistance as per the requirement. The volunteers from Mumbai, Thane, Kalyan, Dombivali, Navi Mumbai, participate actively in this seva. The duration of these courses varies respectively, and they are free of cost. The AADM had organised a special course for the police on request of the Police Chiefs of Dhule, Nandurbar. Moreover, there were training sessions held by the Nandurbar District Officers in Nandurbar and Shahada. The training was also conducted for the ‘BEST’ employees and the Naval Dockyard and in other such authorised organisations so far, as per the government’s request. The courses have also been organised in schools and colleges for students, employees and teachers on request. ‘The Textbook of Disaster Management’, the book published by the AADM, is the best comprehensive guide explaining, ‘What is Disaster?’, It’s causes and measures to be taken in the event of a disaster. This book was first published in English in April 2002. It was then published in Marathi in July 2002. The second edition of the English book was published in December 2002 and its third edition in July 2007. The second edition of the Marathi book was published in November 2008, the third edition in March 2009 and the fourth edition in July 2012. AADM has also contributed towards protecting and promoting the environment-friendly initiatives. So far, about 110 tons of vermicompost has been produced out of 500 tons of waste from all across Maharashtra and has been distributed amongst the needy farmers. The AADM has imparted vermiculture training at the following places in Mumbai – Central Railway Office (Matunda), SEBI (Bandra), Naval Dockyard (Colaba), FDC Ltd. (Jogeshwari), Pochkhanawala Bankers Training College (Santacruz), DIL Ltd. (Thane), Bhavan’s College (Andheri), IES School (Marol) and the school of all the wards of the Municipal Corporation. An instances of vermiculture project is currently operational at the Tunga International Hotel (Marol, Mumbai) and Pimpleshwar Mandir (Dombivali), for which the AADM team is working. Besides, the AADM volunteers set up the vermiculture projects in their households as well. The the fertilizer formed is then sent for utilization. The DMVs carry out the Tree Plantation project at several places along with the other associated organisations. So far, 60,000 trees are planted in Maharashtra with the help of AADM. Annapurna Mahaprasadam Yojana – Meal distribution amongst students in rural areas and villagers from the Kolhapur Medical and Heath Camp. Eco-Friendly Ganesh Idols – Ganesh idols created out of the paper pulp of the Ramnaam Books. Aniruddha’s Bank For Blind – Recording audio cassettes or CDs for the blind students explaining the chapters to them and distributing them for free. Raddi Yojana – This project introduces and implements the idea of recycling used paper. Old is Gold Project – Old, but undamaged clothes, utensils, books, notebooks, toys, and other such commodities, which still can be used and are in reusable condition, can be distributed amongst the underprivileged families. Mayechi Ubb- Making hand stitched blankets and distributing them amongst the aged, poor, children, students and women. Vidya Prakash Yojna- Providing candles and matches to the students, living in the remotest areas where electricity has not yet reached. Control on plastic usage and permanent solution to it. Leprosy and guidance on its apt measures. To spread appropriate information about HIV AIDS and guidance regarding the measures to avoid it. The study of disasters occurring in factories. Sadguru Shree Aniruddha had announced about establishing the AADM for the first time in the year 2002. At the time he had sternly clarified that this organisation is not an adventure club and nor has it been established for the sake of doing adventures. Today, considering the increasing intensity of natural as well as man-made disasters all over the world, it has become of prime importance to be prepared to face them at any time. Many times, the things that cause major upheaval are the diseases and the stampede that happens out of fear after the disaster. At times, the civilians present at the location are unaware of the ways to tackle the problem which in fact, intensifies and aggravates it. At times like these, if more and more people get trained in disaster management, the amount of threat to life in such grave situations can be reduced. Thus, to tackle such difficulties in the future, it is essential for everyone to participate in this course, which is the practical of the Ghorkashtoddharan Stotra. This course is no adventure, but the very need of being well equipped in the times to come.